Christmas is a break from work, a time for presents and hearty meals and quality time with your loved ones. It’s also the time families take full advantage of the December school holidays to catch up with their children. Want a change of scenery from your own backyard but not keen to deal with the hassle of flying? Here are 8 hotels to fully capitalise on the vacation feels, without leaving the country! From tastefully-designed rooms to cosy suites that can accommodate bigger groups, these top picks are perfect for some family bonding time. 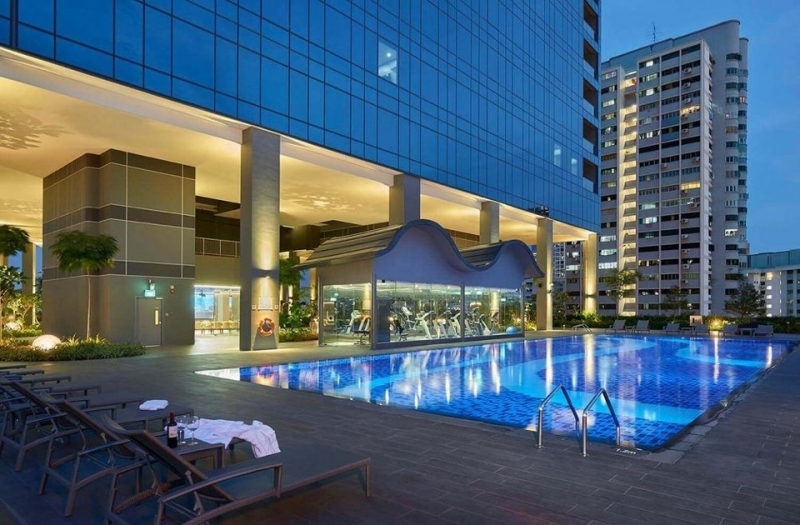 Sitting right in the heart of central Singapore, WANGZ Hotel is the ideal retreat for the city slicker who doesn’t want to be too far from all the action. Located near Outram MRT and with free shuttle services to town, this quiet paradise provides a good balance between excitement and relaxation. Waking up from your undisturbed slumber in your Sealy Posturepedic bed and pillows you have chosen from its exclusive menu, you arise to greet Singapore’s picturesque morning from the sleek balcony. Your day then truly begins after a luxurious experience under the rain shower. Is there really a better way to spend your vacation? This Christmas, indulge yourself in a relaxing staycation at WANGZ Hotel with their festive package! 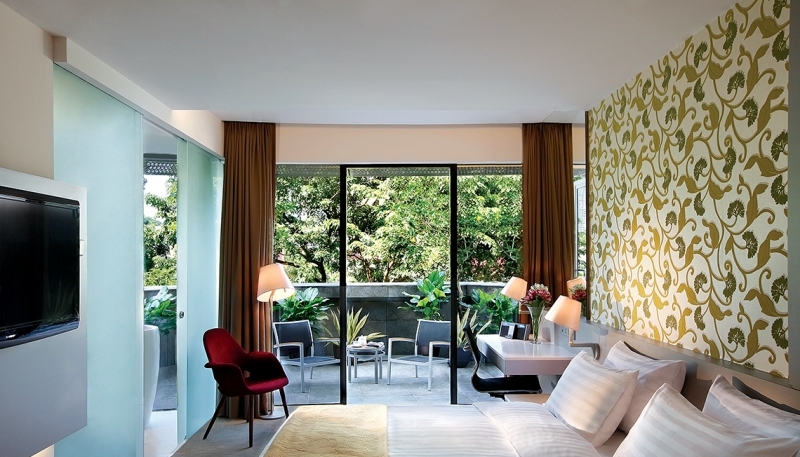 Between 1 November and 30 December this year, you can enjoy a double/twin-use canopy room at only a little over S$218 per night! With this package, you’ll be entitled to 20% dining privileges at the Upper Place rooftop restaurant among other perks, including a complimentary special surprise treat! You can explore the other perks here, but if you’ve already made up your mind, go ahead and book your package through [email protected]. 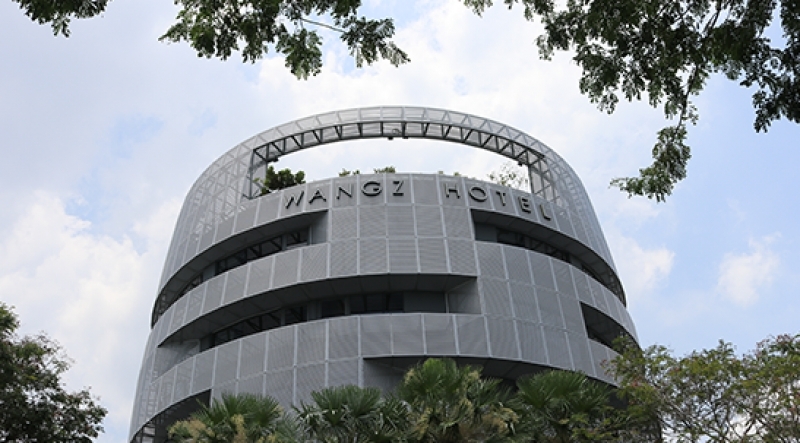 Learn more about WANGZ Hotel. 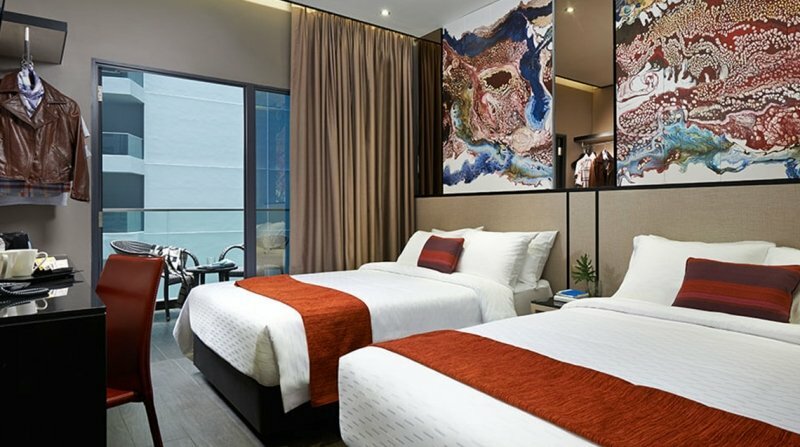 Located a short distance from popular districts like Bugis and Little India, Hotel Boss is a hotel that is easy on the wallet and surprisingly cushy for the affordable price. Each room is cosy and comes with your standard essentials, complete with a wide window for you to wake up to a stunning view every morning. Hotel Boss is especially great for families – your kids can stay entertained throughout the day at the indoor children's playground while you can head over to the Sky Terrace for a dip in the pool. Of course, you can have your staycation at Hotel Boss anytime, but what better time to have it than Christmas, especially when Hotel Boss is so close to these Christmas-themed attractions? Take a short walk and dine at one of Haji Lane’s hipster cafes for a delectable Christmas lunch or dinner! Alternatively, marvel at the sparkling Christmas decorations at Bugis Junction and snap a commemorative photo with your friends! Why not pick up some last-minute Christmas gifts while you’re there? Until 30th August 2019, enjoy 5% off room rates when you make your booking using the promo code <Tripzilla>. Learn more about Hotel Boss. Dubbed ‘your home away from home in Singapore’, Winsland Serviced Suites by Lanson Place promises to provide you with all the comforts of a home without having to fuss about chores. A mere 5-minute walk away from the bustling Orchard Road, this serviced residence is also a chic habitat boasting excellent service. From cosy compact suites to spacious one-bedroom premiere suites, Winsland Serviced Suites is perfect for just about everyone, from couples needing some downtime or groups of friends wanting to make merry. With the facilities provided such as the jacuzzi massage tub and the tranquil lap pool, Winsland Serviced Suites is designed to maximise your comfort. No doubt the Christmas season is a time for gathering and fellowship. And what better way to do it than through food? 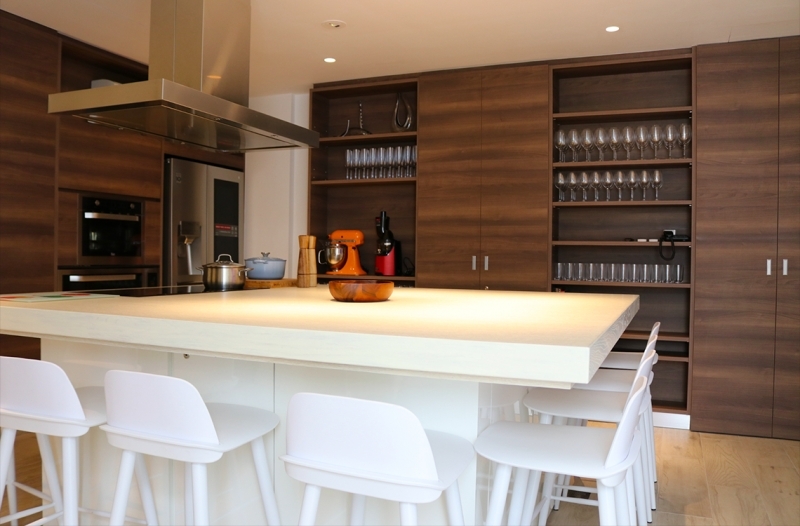 The [email protected] is a fully equipped 24/7 communal kitchen with an island centrepiece that can accommodate a dozen people. This modern kitchen is perfect for hosting potluck parties, so get your squad and get cookin’! 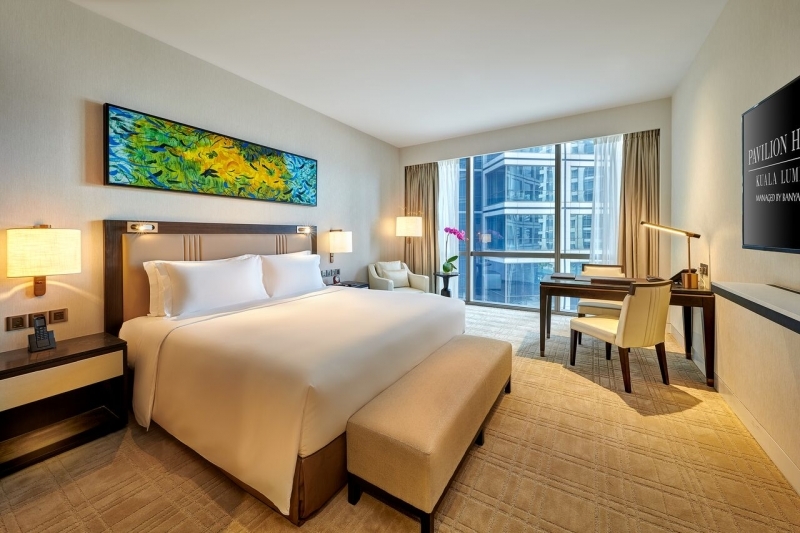 Treat yourself to a 1-bedroom executive suite in a newly renovated apartment complete with a fully-equipped kitchenette at only S$288 per night. This includes a daily breakfast set at Kith restaurant worth over S$25 as well as discounts for food and beverages at Kith restaurant and KPO Cafe Bar. Find out more about the other facilities you get to enjoy here. Contact Sales at [email protected] to enjoy this special offer. Learn more about Winsland Serviced Suites by Lanson Place. Standing at 275 metres and a stone’s throw from KL’s famous Petronas Towers, Element Kuala Lumpur is the tallest eco-conscious hotel in Malaysia, and it’s really no surprise. The building was designed to let natural sunlight do half of the work through floor-length windows and supplemented the other half with energy-efficient LED lighting. This is just one of the many aspects of their eco-efforts! Being conscious of the environment at no expense to the customer is one of the reasons why we love Element so much. From roomy studios (already fitted with a spa-inspired bathroom and a kitchenette!) for couples to spacious two-bedroom suites perfect for larger families (practically a fully-equipped apartment itself), Element has a suite for every kind of traveller. Book a room and rest easy in their signature Heavenly Beds knowing you’re doing your part for the environment. If you’re planning to stay at Element for at least two nights between 20th December and 6th January, make your booking before 30th November to cash in on this special package. This package includes welcome drinks, an in-house gift and a free upgrade to the next room type. Additionally, you’ll also get Food & Beverage credits worth MYR100 and two breakfast meals per room. If you’re here over Christmas or New Year’s Eve, be sure to check out their festive buffet. Keep an eye out for a whole Norwegian salmon trout, Australian Angus prime rib and oven roasted lamb leg - these are the dishes not to be missed! TRACE restaurant at Element invites you to join them on Christmas Eve and Christmas Day for an exclusive dinner and brunch. 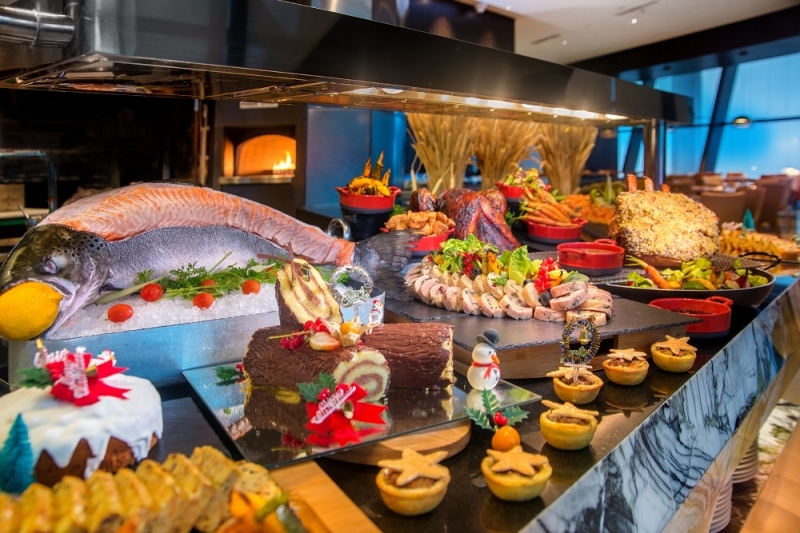 For a price of RM138 nett (adult) and RM70 nett (child), indulge in the specially prepared festive buffet, complete with meal-time entertainment. Also, enjoy perks like free-flow wine at a small top-up. Special early bird promotion! Enjoy 20% off when you make your booking before 10 December, or contact Element for more information on this exclusive buffet. Already made your Christmas plans but don’t want to miss out on this exclusive meal? Not to worry! TRACE restaurant is hosting another special buffet on New Year’s Eve at RM158 nett (adult) and RM70 nett (child). Contact Element for more details and make your booking early to enjoy the special early bird promotion! Want to enjoy Element’s TRACE restaurant’s good food but in the comfort of your own home? No problem! 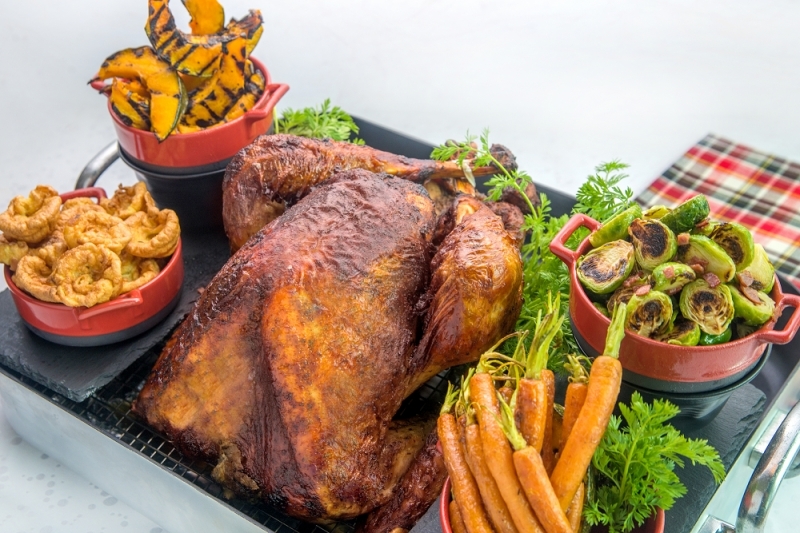 For the month of December, you can order a turkey-to-go at RM388 nett. Each bird is Halal-certified and specially prepared by an in-house chef. The roasted turkey comes with a variety of sides, like roasted potatoes, brussel sprouts, cranberries and apple-chestnut stuffing. 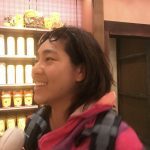 Learn more about Element Kuala Lumpur . Housed just above Pavilion Kuala Lumpur – an award-winning six-storey shopping centre, Pavilion Hotel Kuala Lumpur features a stylish décor and impeccable service to match. With their comfy beds and modern amenities, Pavilion Hotel is the perfect urban getaway for people who want to spend their Christmas break away from the bustle of their everyday life while still being accessible to all the excitement life has to offer. From lounging in the infinity pool on the roof to having your stress pressed out of you in the award-winning Banyan Tree Spa, or enjoying one of the many delectable dining options available, Pavilion Hotel makes a great all-rounder staycation destination. Did we mention the Whiskey Cove? 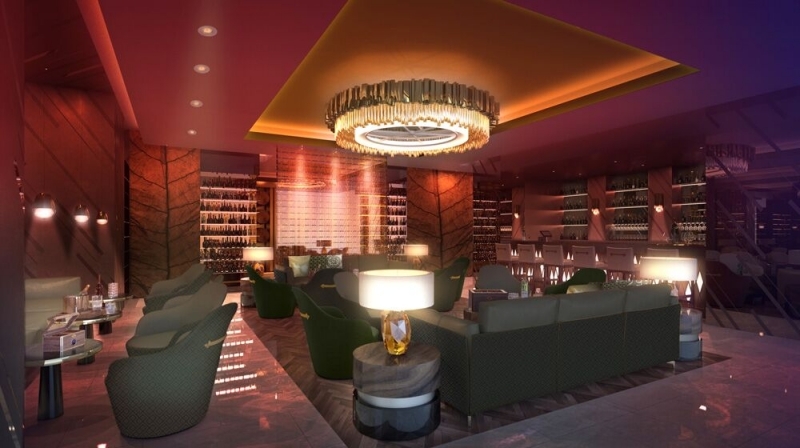 It’s a cosy whiskey bar in Pavilion Hotel offering blends from around the world! If you’re staying at Pavilion Hotel Kuala Lumpur between 1 December 2018 and 31 March 2019, contact the hotel and enjoy a special rate! From only MYR498++ per night, guests get to enjoy daily complimentary buffet breakfasts and several exclusive discounts to the spa and shops. For more information on this promotion, click here . To make your reservation, contact Pavilion Hotel . InterContinental is known for its luxurious hotels, and InterContinental Bali is no exception. Located along a white sand beach overlooking the Jimbaran Bay, InterContinental Bali is a paradise in the heart of island-paradise Bali. 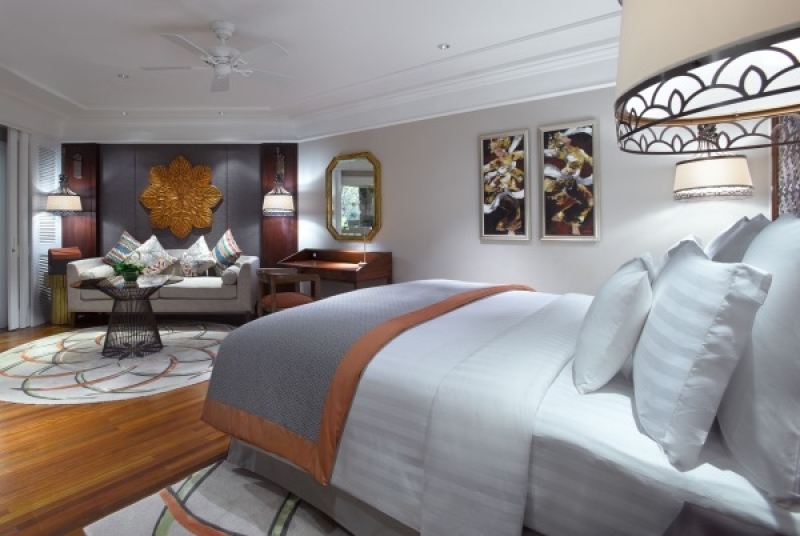 Each room is spacious, decorated with unique Balinese motif, furnished with cosy beds and exude a homely warmth, unlike most generic hotel rooms. If this isn’t enough to help you refresh your mind and soul, then head over to the in-house Spa Uluwatu to rejuvenate your body! With five restaurants, six pools, excellent services and luxurious amenities, it’s hard to choose anywhere else to have your staycation in Bali. Not just that, but the long stretch of white beach and 14-hectare landscaped garden make for a picturesque and Instagrammable background to your indulgent stay. InterContinental Bali is holding a special promotion to include airport transfer, exclusive buffets and an hour-long Balinese massage for you and your travel buddy. So if you’re planning to stay between at least three nights between 20 December and 5 January, hurry and make your booking by 15th Dec! Check out here for more info. Learn more about InterContinental Bali Resort . Holiday resorts in Bali are like the sand on the glistening beaches they advertise -- too many to count. That said, Grand Mirage Resort & Thalasso Spa should be on the top of travelling families wanting a relaxing staycation with recreation and meals taken care of by someone else. The view is stunning, the rooms are spacious, and many children-friendly facilities like a kiddie club and outdoor playground are available. Additionally, this resort also boasts an arsenal of water sports, all free of charge to the guests. Besides the wide range of accommodation choices from couples in cosy rooms to larger families in the swanky thematic suite, the main pool is plain stunning. 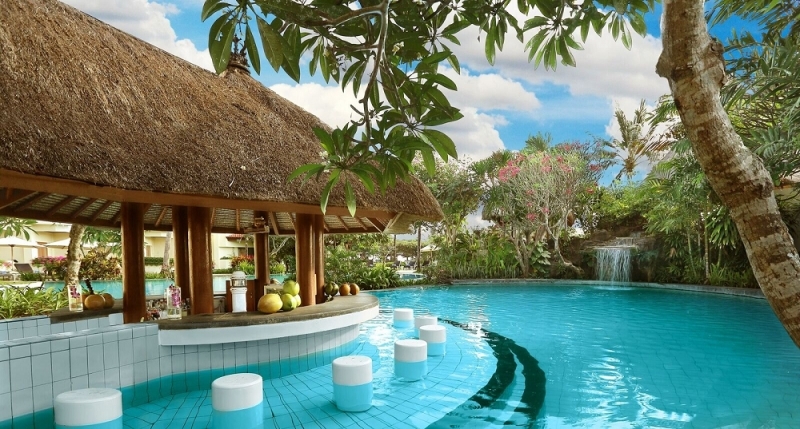 Enjoy a cooling dip in the pool and nurse your coconut-drink at the pool-side bar, or should I say in-pool bar; that’s the best way to spend your tropical staycation! Grand Mirage Resort is conducting festive season programs on 14 Dec, Christmas Eve and Christmas Day! From canapés and cocktails to carollers to exclusive menus designed by their in-house chef, a photo opportunity with Santa Claus and a marching band, Grand Mirage Resort and Thalasso Bar certainly know how to celebrate the holidays. Click here for more information. When someone mentions taking a staycation in Indonesia, the first thing in your head is probably Bali; and yes, while Bali is an extremely popular destination, it’s not the only place for an exceptionally enjoyable staycation. Case in point: Alila Solo . Alila Solo is located in the main commercial district of Jalan Slamet Riyadi, and the panoramic view from the tallest building in Central Java is unparalleled. Step into the rooms and you’ll find them luxuriously spacious. Alila Solo doesn’t skimp on luxuries: pop a Nespresso capsule into the Nespresso machine in your room and lounge on the King Koil mattress as your coffee brews. What a relaxing way to start your staycation! What’s even better? The gym, bar and the Olympic-sized pool are all on the roof. Cue whichever recreational activity you favour, all the while enjoying the spectacular view. Have an Enchanting Dinner on Christmas Eve! Only on Christmas Eve this year, Epice Restaurant is holding an exclusive dinner for only IDR 385.000nett per person. Not only will you get to enjoy delicious food, but also be serenaded by a children choir and live music as you dine. Don’t miss out on this amazing opportunity to snap a photo with the big red man himself at the dinner! For more information, call +62 271 6770888 . Jingle bells are ringing, and so are these deals calling out your name. Whatever the case, these eight places are a great start to your holidays, so book your room, kick back and turn on ‘It’s a Wonderful Life’.